I thought I had published this FO report, but it turns out that WordPress ate it or something. So I’m publishing on their 11-month anniversary! Bon Anniversaire, ornaments! 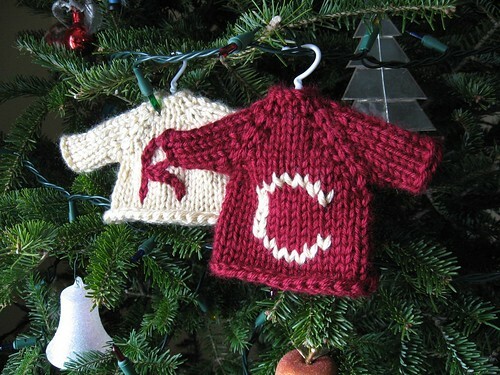 Pattern: Rough guideline to Sweater Ornaments from brooklyntweed. Yarn: I think it was Bernat Satin Sport. It’s not bad in terms of sheen, but it is acrylic so it isn’t as flexible as a natural fibre. Modifications: I adapted the recipe for knitting flat because when I decided to start them I only had bigger circs on hand. Would I knit it again? Yessirree! These are great gifts. 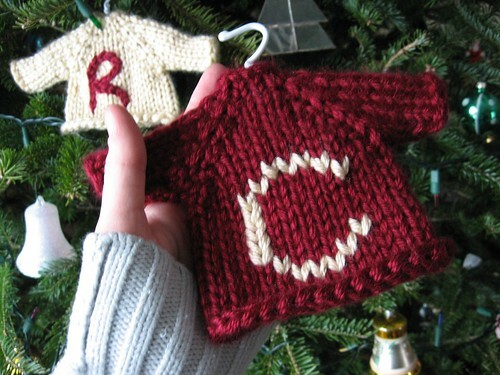 I gave these to my aunt and uncle, whose initials are R and C, hence the letters. I also made a pair for my other aunt and uncle, but I forgot to take pictures before gifting them. I knit the base colour first, and then either duplicate-stitched the letters or embroidered them. It was really fun! I got the hangers at Michael’s. They’re for doll clothes. Idunno about you, but when I had dolls (only one or two, but I still had ‘em), I kept the clothes rolled up in a ball. Once a clothes-baller, always a clothes-baller. These were about a dollar each. Happy Christmas Eve, suckaz! I am finishing things like all get out. Yarn: Higgins Tweed, sadly discontinued. Modifications: None! The pattern was wonderful, perfectly clear and needed no improvements. 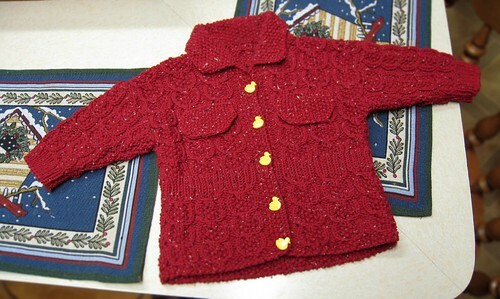 Would I knit it again? I love this little jacket so much. 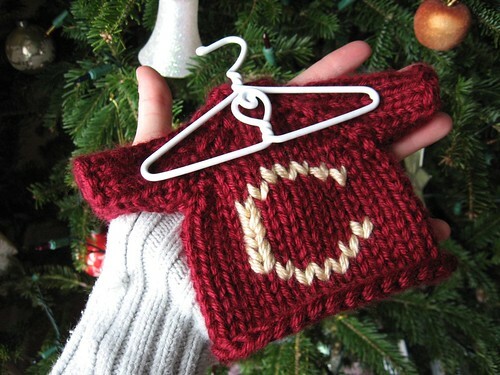 I would definitely knit it again for any future babies that spring from my womb, but I think I’ll stick to knits that require less seaming when I knit for other people’s babies. I don’t have much time for finishing, because I prefer to knit on the TTC instead of seaming and all my other time is taken up with school. I’m terrible with putting it off, so it takes me longer to finish a seamed object than a non-seamed object, which means there’s greater pressure and I constantly fret that the baby will get too big and the present will be ruined. Still, it came out fantastic and hopefully the parents will like it. Give me a D! D! Give me an R! R! Give me an A! A! Give me a G! G! Give me an O! O! Give me an N! N! Liz’s Christmas present, that’s what that spells. The new Knitty has a dragon pattern, and I’m going to knit it. Sheldon is also really cute. And now back to backpropagation, Kohonen networks and genetic algorithms. Just one more day, Eve… One more day. Here’s a nice big list of some dragon patterns I’ve found on the internet. This seems to be the only knitted dragon, and I find it’s a bit too big. I may attempt some crochet instead, or make up something with some really fuzzy yarn. These three dragons here make me want to buy Kuschelterie hÃ¤keln by Beate Hilbig. I’m still on the lookout! 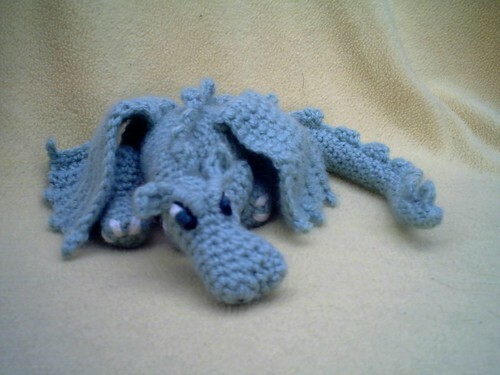 If I were more confident with crochet I would try making this dragon. Etsy is down right now, but when it comes back up you’ll be able to see Yarnigans’s Cerulean dragon, UnaVanora’s Soft Crocheted Dragon, concertinapieces’s Water Dragon, and seeparis’s Green and Yellow Dragon for sale. A purple dragon; don’t think that’s a breed but I wish it was.